The captain of the Alitalia airliner shouted "Look out" to his co-pilot at the sight of a brown missile-shaped object shooting past them overhead. After ruling out the object flying past the Alitalia jet being a missile, weather balloon or space rocket, the MoD closed the inquiry. Nineteen files covering sightings between 1986 and 1992 are being made available online. Almost 200 such files will be made available by the MoD over the next four years. The current batch also includes a US Air Force pilot's account of being ordered to shoot down a UFO that appeared on his radar while he flew over East Anglia. There is also an MoD request that army and navy helicopters not take photographs of crop circles, because of concerns about undermining the official line that the military did not investigate unexplained phenomena. And the files also contain a letter from a woman claiming to be from the Sirius system who said her spacecraft - also containing two "Spectrans" with "Mr Spock ears" - crashed in Britain during World War II. 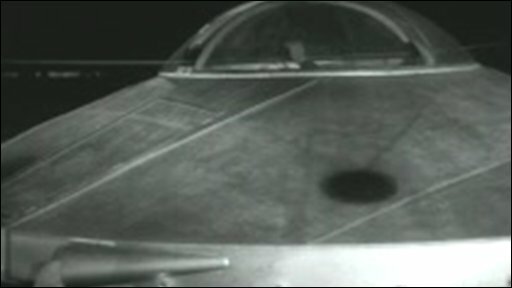 UFO expert and journalism lecturer at Sheffield Hallam University, Dr David Clarke, said the documents would shed new light on relatively little-known sightings. He said some conspiracy theorists would already have decided that the release of the papers was a "whitewash". He added: "Because the subject is bedevilled by charlatans and lunatics, it is career suicide to have your name associated with UFOs, which is a real pity. "The National Archives are doing a fantastic job here. Everyone brings their own interpretation. "Now you can look at the actual primary material - the stuff coming into the MoD every day - and make your own mind up." Dear MoD: where is ET?